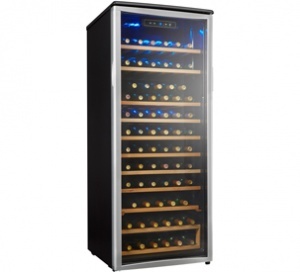 This executive-class Danby Designer wine cellar is the perfect way to showcase your esteemed wine collection as it can store and chill up to 75 bottles of your favorites with its impressive 10.6 cubic-foot capacity. The stunning all-black cabinet and platinum-trimmed door adds elegance to any setting while the blue interior display-light illuminates your collection without the heat of an incandescent bulb. The easily-accessible blue-LED digital thermostat allows you to quickly and easily program the interior temperature precisely between 43°F and 57°F (6°C and 14°C). The wine bottles are gently stored and accessed on 8.5 roller-glide, beechwood-faced shelving units to limit agitation. There’s also a staggered, removable two-tier beechwood shelf and a beautiful tinted tempered-glass door to keep harmful ultraviolet rays at bay. This clever unit also features a handy reversible door swing which can be adjusted for left or right-handed opening. The popular wince cooler comes with an 18-month warranty on parts and labor with convenient in-home service.